Last year, most financial experts — really, anyone who kept up with Fed moves — were certain that interest rates would finally begin to rise in 2014. Now, eight months into the year, mortgage rates are still at record lows and — surprisingly — consumers aren’t even taking advantage of them. Mortgage originations have declined every quarter since 2012; but if interest rates only have one direction to go from here, why aren’t more potential home buyers jumping at the chance to lock into low rates for decades? There are many reasons locking into a low mortgage rate now is crucial. When it comes to 15- or 30-year mortgages, a 10th of a percentile can make a huge difference in terms of costs over the life of a loan, as well as month over month. And when rates do go up — which they will, sooner or later — home buyers will be looking at hikes of more than just a few basis points. According to Freddie Mac, average mortgage rates reached a high of 16.63% in 1981, eventually dipping to pre-recession rates of 6.41% in 2006. At that percentage, total interest paid over the life of a loan (at the current median home price of $215,000) would amount to $215,718, with monthly payments of $1,301. Compare that to the 2013 average of 3.98%: Total interest would be almost halved, at $122,902, and the monthly payments would be more than $250 cheaper. 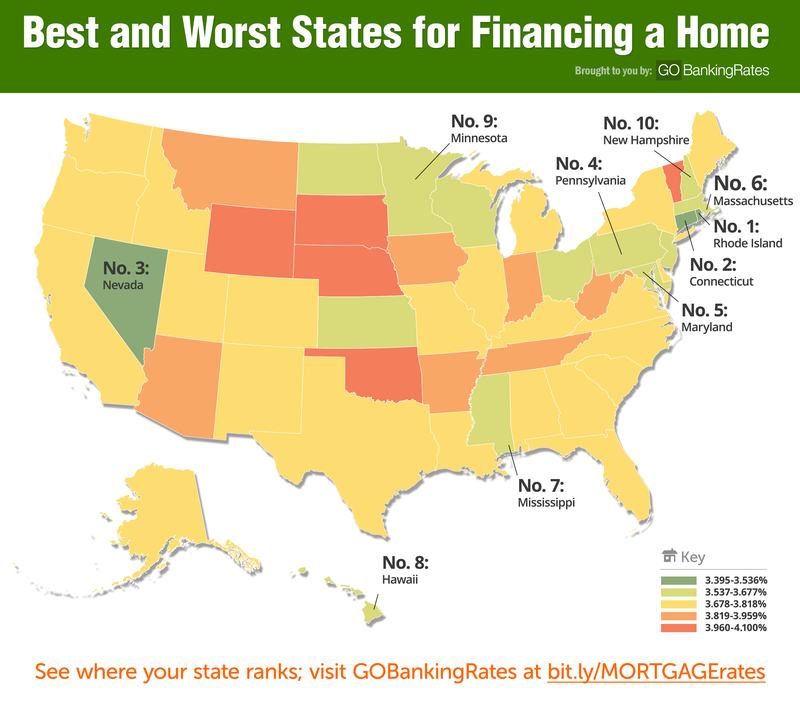 To demonstrate why 2014 is the year to take advantage of record-low rates — and highlight where consumers can find the best interest rates in the country — GOBankingRates partnered with RateWatch to survey average mortgage rates across the U.S., ranking the 10 most and least affordable states for taking out a home loan. Several factors work in tandem to drive mortgage rate changes. On the national level, the prime rate, LIBOR, bond yields, inflation and mortgage-backed securities all affect interest rates. Regionally, factors like borrower demand, local property values, default rates, loan concentration and unemployment can play a part in mortgage rate variation, as well. So where is the cheapest place to take out a loan? Of the 10 best states for affordable mortgage rates, six are located in the Northeast. Conversely, six of the 10 worst states for mortgage rates are located in the Midwest and Northwest. These trends could be somewhat attributed to the local housing markets, specifically local home prices, according to David Donhoff, a certified mortgage planner. Local mortgage rates are also largely dictated by the principle of supply and demand. If a region’s economy is struggling and the unemployment rate is high, people will be less likely to be buying houses, forcing rates to fall to entice borrowers. Likewise, if housing demand is high thanks to local job growth and a strengthening economy, buyer demand will increase, allowing rates to do the same. Variations in risk can also affect the rates consumers are offered. Matt Shibata, CFA and portfolio manager, brought up an often over-looked mortgage influence: closing costs. Several months ago, James Bullard of the Federal Reserve Bank of St. Louis predicted that interest rates will rise in quarter one of 2015, at which point we can likely expect mortgage rates to return to pre-recession levels as well — around the 6% mark last seen in 2006. Bolstering this prediction, the economy is regaining momentum; the Dow Jones, Nasdaq and S&P 500 are all performing once more. As various economic factors and Fed policies fall into place, mortgage rates will go up — eventually surpassing early 2000s numbers and hitting the rates last seen during the economic height of the 1990s — the 7-8% range. And before that happens, potential home buyers would do well to capitalize on the today’s record-low rates. Purchasing a home now rather than waiting could make all the difference — hundreds of thousands of dollars in difference — down the road. Click to the next page to see the complete rankings. Discover this year's top products for identity protection. Quicken Mortgage Review: How do Quicken Mortgage Rates Compare? Who Are Fannie Mae and Freddie Mac and How They Affect Your Life? Should Homeowners Refinance While Interest Rates Are Low?